Today is Thanksgiving in Canada, so it seems especially appropriate to feature a novel that reminds us that some families are struggling today. This is an absorbing read, especially for children ages 11 and up with challenging family situations. Charlie feels like she's always coming in last. From her Mom's new job to her sister's life away at college, everything else always seems to be more important than Charlie's upcoming dance competition or science project. Unsure of how to get her family's attention, Charlie comes across the surprise of her life one day while ice-fishing . . . in the form of a floppy, scaly fish offering to grant her a wish in exchange for its freedom. Charlie can't believe her luck until she realizes that this fish has a funny way of granting wishes, despite her best intentions. But when her family faces a challenge bigger than any they've ever experienced, Charlie wonders if some things might be too important to risk on a wish. The Seventh Wish was written by Kate Messner and published by Bloomsbury in 2016. I think this is the first novel I’ve read that includes both Irish dancing and ice fishing! For me, the magic fish reminded me how sometimes we wish for a quick solution that will make things better but in reality there are some difficulties we can only get through with time and hard, emotional work. The ending of the story was realistic and hopeful. This is a good story to study to see how to create a fully realized picture of the many elements that make up middle school life – friends, family, activities and interests, homework… It’s so interesting to see how the author manages to balance all of these elements in the same story! Many students need to cope with difficult family situations, like addiction, so I think it’s an important novel to at least have available in the classroom. I really liked the way the story showed the family taking time to work through the situation. This story has connections to curriculum related to substance abuse and addiction. Kate Messner has written many middle grade novels including Eye of the Storm, Capture the Flag, The Exact Location of Home and the Ranger in Time series. 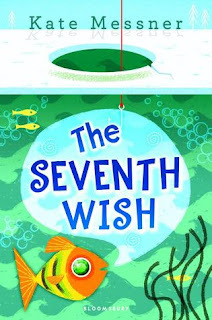 There’s a teacher’s guide for The Seventh Wish on Bloomsbury’s website. Sounds like a great story. I think a lot of kids can relate to everyone else in the family doing better, having more issues, and seeming to be more important. Fun how the story had a wish-fulling fish.